Mirrorless interchangeable lens cameras (MILC) are becoming increasingly popular. This new breed started gaining momentum with micro four-thirds cameras like the Olympus PEN E-P1, which use 4/3-type sensors that are half the size of sensors used in entry-level digital SLRs and about nine times the size of sensors used in compact cameras. The latest development in the MILC segment is models that use APS-C size sensors. The first such camera was the Samsung NX1, and now we have two models that Sony recently added to their Alpha brand, NEX-3 and NEX-5. Both models sport a 14.2 megapixel sensor and HD movie recording capabilities. The major difference between the two is that the NEX-5 boasts 1080i video recording and the NEX-3 does it at 720p. The retail sample of NEX-3 that we got from Sony had the body, 18-55 mm kit lens, add-on flash, battery charger and neck strap. Despite a large sensor (23.4 x 15.6 mm), the NEX-3 is very slim (33 mm), unlike DSLRs, which are twice as thick. DSLRs get the bulk from the mirror box and the optical viewfinder mechanism through which you can see the frame via the lens. The mirror box has a mirror, which reflects the image of the frame to a five-sided prism (pentaprism). When you see through the optical viewfinder, you see the frame reflected back by the pentaprism. On releasing the shutter, the mirror flips upward and makes way for light to reach the exposed sensor. After the photo is shot, the mirror returns to its position. That’s why you hear a prominent clapping sound when you shoot with a DSLR. Mirrorless cameras are slim because they don’t use a mirrorbox. Hence, they don’t have an optical viewfinder and the flange focal distance from the lens mount to the sensor is also less. So you have to frame your shots using the LCD. The NEX-3 features a 3-inch flip out LCD with a resolution of 921k dots. The LCD flips up 90 degrees and can be tilted 45 degrees downward, but it doesn’t flip out sideways or rotate. This acts as a limitation when you want to shoot from odd angles. Nevertheless, it’s good enough to shoot in a crowd with the camera over your head or if you wish to get a bug’s-eye view of the subject. The control panel to the right of the screen comprises two buttons, whose function depends on the mode you’re using, and a jog dial that doubles up as a 5-way d-pad with a button at the center. There’s a small rubber patch at the top-right corner, which lends a good grip. You use the index finger to release the shutter and the last three fingers curl around the body. The grip isn’t as satisfying as holding a DSLR camera because it’s too slim. Also, the grip surface is plastic with tiny square blocks, unlike DSLRs, which offer a rubberized surface. The top houses the playback button, stereo mic and a proprietary Smart Accessory Port. Besides the bundled flash, you can also use an optical viewfinder and stereo microphone, which are optional. The flash can be enabled by simply lifting it up. Both cameras use a new E-mount for compatible interchangeable lenses. The choice of lenses is very limited, but you can use A-mount lenses meant for Sony’s Alpha DSLR cameras with the LA-EA1 adapter, which is again an optional accessory. The bundled 18-55 mm F3.5-5.6 lens has a metal finish and is of excellent quality. 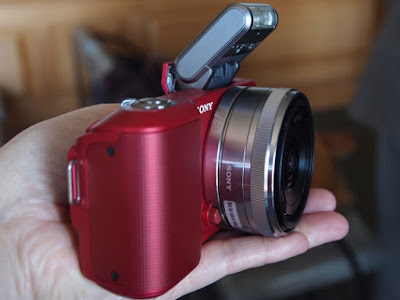 It employs Sony’s Optical SteadyShot tech for image stabilization and the plastic petal hood cuts out flare. 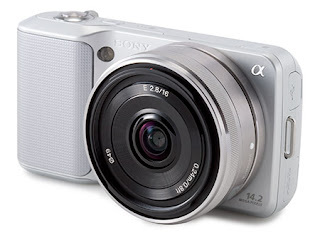 The NEX-3 is a breeze to use thanks to its intuitive user interface. The Menu button brings up the main menu from which you can choose the shooting mode, camera settings, image parameters and playback settings. You can use the jog dial or the d-pad to scroll through the menu. It would have been more convenient if there was a mode selection dial on the top rather than having to press the center button of the d-pad and using the jog dial each time you wish to change the shooting mode. A good thing here is that a detailed description of the mode is displayed on the screen. In addition to the Intelligent Auto mode, which automatically identifies the characteristics of the scene and uses appropriate exposure settings, there are Program (P), Aperture Priority (A), Shutter Priority (S), Manual (M), 3D Sweep Panorama, Sweep Panorama, Anti Motion Blur and Scene Selection modes. So depending on the subject, lighting, type of scene, and your knowledge of exposure settings, there’s pretty much everything to choose from. The most interesting mode is Sweep Panorama, which lets you capture a 180 degree panorama. This feature is offered in Sony’s premium digital cameras, but it has a different feel here. The moment you release the shutter, the camera goes ‘click’, ‘click’, ‘click’ rapidly. You’re supposed to pan the camera 180 degrees from left to right. The results are outstanding. 3D Sweep Panorama shoots 3D images, but they can only be viewed with 3D glasses on 3D TVs. The camera has a mini HDMI jack for video output. the selected mode and get better shots. The NEX-3 stores images in JPG and RAW formats. The package includes a 4 GB SD card. We used this camera for almost a week. We shot portraits, took photos in low light, tried out all the modes, and explored all the functions. The focusing speed of the lens is excellent; half-press the shutter release and it takes no time to focus on the subject. The colors and details came out very well. We were impressed particularly with the photos captured in low light with high ISO values. The ISO can go as high as 12800, which sounds gimmicky, but it actually isn’t. Even at ISO 6400, where most DSLRs struggle, low light shots with this camera didn’t look bad. The images were noisy, but the quality was acceptable. However, high ISO values can only be set in PASM modes, which is a big drawback. In iAuto and Scene selection modes, the ISO doesn’t go beyond 1600. Videos shot at 720p also looked nice. Manual zoom while shooting videos is allowed and the focusing is taken care of by the camera. The overall imaging performance is good, but the battery life of this camera is a major turn-off. After every few shots, you’ll find a drop in the battery indicator. The drain is all the more quicker with RAW mode and flash enabled. The biggest advantage of mirrorless cameras is that you can get DSLR-like image quality without lugging around the bulk. Although not pocketable, they are very compact and feel a lot lighter and more comfortable than DSLRs when hung around the neck. 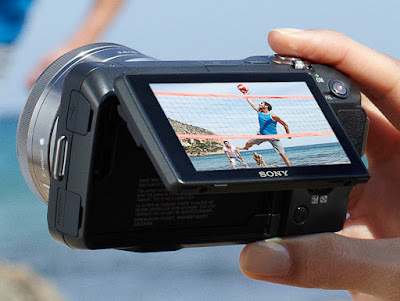 For Rs 29,990, the Sony NEX-3 is a few thousand Rupees more than entry-level DSLRs like the Canon EOS 1000D and Nikon D3100. The premium would have been justified had the battery life not been dismal and a few issues ironed out. Nevertheless, thumbs up to Sony for a brilliant attempt.